The entire holy Quran micro sized, Micro Quran for Muslims - للمجوهرات الدينية مسلم، القرآن كريستال (نانو القرآن ®) هي عبارة عن بلورة صغيرة على الذي يرد في القرآن كله باستخدام تكنولوجيا النانو وعملية الكتابة الفرعية ميكرون. 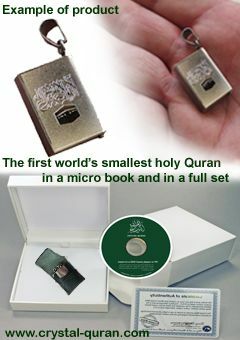 The first world's smallest "nano Quran®"
A commitment to deep beliefs and a philosophy of life. A piece to be meant to last forever. 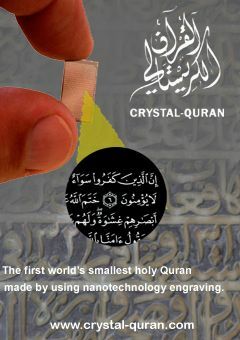 The first original world's smallest edition of the Holy Quran made with Nanotechnogies process. 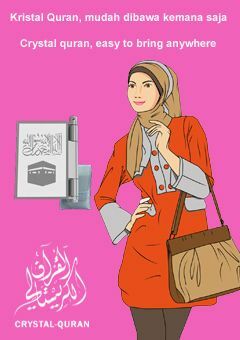 Qur’an is the greatest source of guidance for man and is unmistakably the most precious divine source of wisdom. With grace of almighty Allah, we have been blessed with the Qur’an, which is the most beautiful form of expression for Muslim believers. 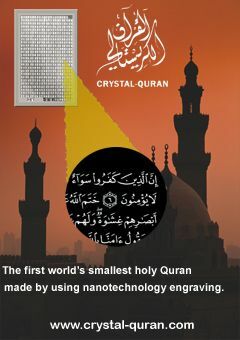 The “Crystal Quran” ® “Crystal Qur’an”, “Nano Quran” is the first original world’s smallest Qur’an-e-Kareem ever made using nanotechgnology. 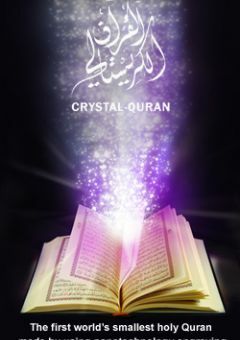 The entire Quran, every page, all the 144 verses (Aya) are reproduced on a tiny glass crystal. This small crystal is then embedded into some beautifully items. 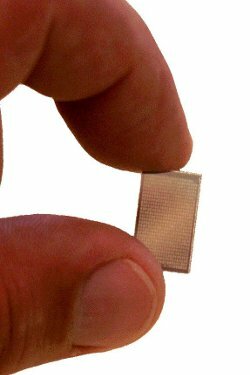 By using highly advanced Nano-Technology we are able to reduce the original book printed text of the Holy Quran few hundred times reduced and then engrave the text on to the surface of a crystal making in 2001 the first original world's smallest microscopic Quran ! 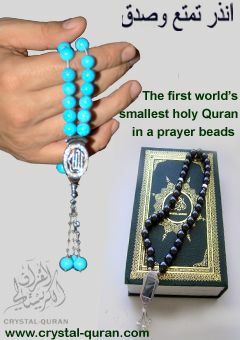 This is truly one of the most timeless Micro Quran's and perfect item and gift for all ages. The Word of Allah promises health for your body, prosperity for your finances, absolute peace in your heart and mind, long life, and most importantly eternal life filled with no more tears, no more sorrow and absolute bliss in the company of the Creator of the universe! All living beings would like to be under the gracious presence of the Almighty (Allah). Nevertheless with a hectic lifestyle backed with modern living, sometimes we fail to take heed of the practices that our ancestors used to follow. Even sometimes we fail to attaining Namaz (prayers) 5 times in a day. However, since modern technology is taking us away from our roots, why not use it as a tool to implement and practice things you always wish for. This Crystal Quran will keep you remember Allah Almighty, remind you to pray everytime and everywhere. Make your heart and mind closer to the holy Quran. You and your loved ones can now bring the Holy Quran at anytime!
" 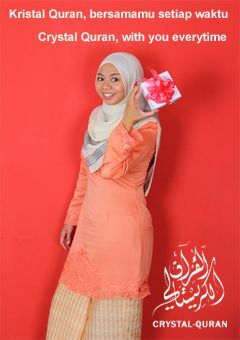 Remember me, I shall remember you "
(Al-Baqarah 2:152) is stated in the holy Qur’an by Almighty Allah.